Dash Motorworks offers different options for extended warranty coverage for additional peace of mind. Please contact your online sales representative if you have any questions or would like more information. The PriorityOne Plan, our most comprehensive protection option, is the HIGHEST level of protection we offer to our customers. Basic exclusions are normal maintenance items such as battery, brakes, light bulbs, belts, tires, wheels, etc. Coverage meets or exceeds even most Factory Certified programs and upto 7 years / 150,000 miles. Ultimate peace of mind protection for your vehicle! 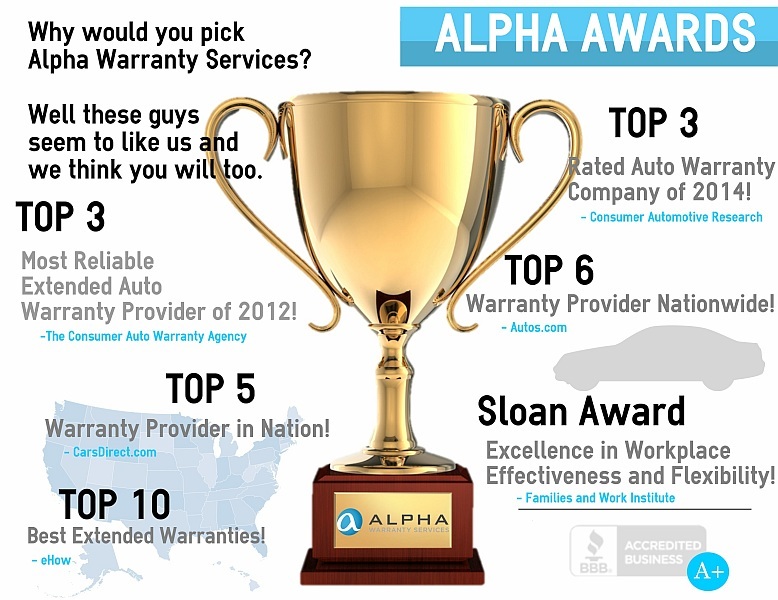 Alpha Warranty PriorityOne Service Contract details and prices are available upon request. Please contact us if you have any questions or would like more information. A warranty company you can trust. Here are company Awards and BBB Rating. AM Best A-Rated Insurance Company. Full Retail Parts and Labor Rates. Remaining Warranty option allows you to add / wrap the Alpha Service Contract to the balance of the factory warranty. Fast, accurate and reliable claims processing with an impeccable track record. So how do you protect yourself? The NSD Traceable Theft Protection Program is a highly effective way to keep your car safe from professional thieves. The Theft Protection Program provides a unique identification code that is permanently affixed to your vehicle. Because thieves know that vehicles equipped with such protection systems are easily traceable by police, they frequently will seek out other easier targets. Sitemap | Copyright © 2017 Dash Motorworks. All rights reserved.